Bring in the New Year powerfully with a commitment to yourself, and please read this post for the latest updates! Happy Holidays! That's right, now's the time to create a powerful, healthy, wholesome, healing diet for yourself! If you're not already macrobiotic or want to learn more, attend some classes at Studio Mugen and go eat at Seed (now open)! Remember, your health is everything, and if you have it you have everything. I haven't been here for a few weeks and it's good to be back. I miss volunteering. I get so caught up in my own life and find that everything's all about ME, and not ANYONE ELSE! I enjoy giving myself to others for a change, instead of always giving myself to me. It's easy to make excuses to not do good things, but ultimately it's not very rewarding and the satisfaction derived from this is fleeting; it doesn't last. On a lighter note, I have found that drinking miso soup (I know, I know, I've talked about this in previous blogs! :) ) makes me feel better throughout the day. It's so warm and healing. Drink your miso soup as much as possible, preferably every morning. After I post this blog Sanae and I are going to have winter soup, and then I will take the dogs for a walk. It's gray and cold today, and we're expecting rain, so it won't be a long walk, but the dogs don't care! They're just so happy to get out and walk! Also, visit the events page at http://www.loveericinc.com/events_en.html for upcoming events and activities at Studio Mugen. Until next time, don't forget to pay a visit to Seed for your winter diet, and have a wonderful holiday season and a great New Year! All of us at studio mugen would like to wish you a Happy Holiday! We hope you have a safe one, and get to spend a joyous time with your friends and family. I will be spending time in Los Angeles with my friends cooking and eating tons of delicious vegan food! Eric and Sanae gave me their dessert cookbook for Christmas, so I will be making decadent desserts for all my friends. Yummm! Seed will be closing early Christmas Eve and will be closed Christmas day and the 26th. Eric and Sanae have been working really hard and deserve a break! Jessica Porter teaches at studio mugen! We are very excited to have Jessica Porter again at studio mugen in January! She is the author of The Hip Chick's Guide to Macrobiotics and will be teaching three amazing classes to help you on your way to health and happiness. Winter Cooking: Winter is a very special time when energy gathers in the body; we need to keep warmth inside ourselves, so we need to heat things up in the kitchen. EVEN IN CALIFORNIA! In this class, we will bake, stew and deep fry! Comfort Foods: In this class we cover two amazing recipes in depth. First, you will learn how to make your own seitan--which is incredibly easy once you've seen it done, but almost impossible to learn from a recipe! Second, we will build the most amazing lasagna, with seitan, portobello mushroom, 3 kinds of "cheese" and carrot/beet tomato sauce. Bring your appetite! Spring Cooking: They say Spring doesn't being until March 21st, but that's not true. The energy begins to lift and expand on December 21st and by the end of January vegans and macros can really feel changes happening in their bodies. In this class, we learn how to lighten up in the kitchen as springtime approaches. It's one of the most delicate and yet important transitions of year. We will press, toss and make a lovely spring soup in this class. Register and pay by January 14th to receive $10 off a class! Register and pay for all 3 classes by Jan 14th and get $30 off! *Please bring pen, notebook and indoor shoes or socks. *If you wish to take food home, please bring your own container. *Please bring your own plate and chopsticks. Studio mugen's sister company is "Seed"restaurant, located in Venice, California. 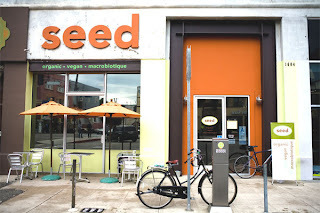 Seed prepares vegan, macrobiotic cuisine without using any refined sugar or chemicals. They also use filtered water for cooking and locally-grown organic produce when possible. Their wholesome, minimally-processed food is prepared according to macrobiotic principles and their menu features burgers, paninis, curry bowls, desserts, organic teas and more. If you are ever in the neighborhood, drop by! 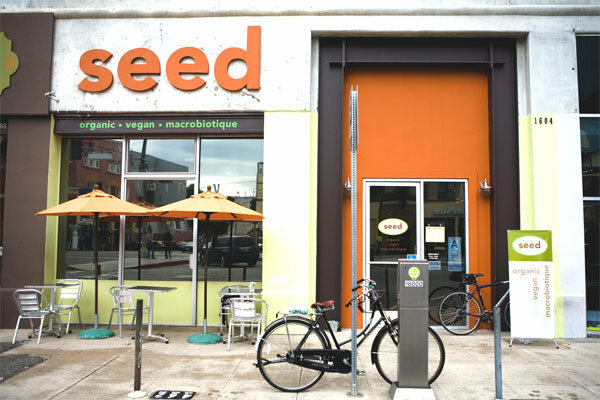 If you have already eaten at seed, please review your experience online at Yelp.com, Citysearch.com, and HappyCow.net. Also, seed offers gift cards available for any amount, making for the perfect gift for friends and family who enjoy healthy and delicious food. Special for the holidays, seed offers a Holiday Bento Box for pickup on Christmas Eve. hello! !Everybody left today!It's just me,Kula & Oro! !So much silence around here,nothing like where I live! !Here I only hear birds!Where I live I only hear cars and people screaming! Anyway...sorry I missed U all last week, I was actually at a macro retreat helded by Lino and Jane Stanchich in North Carolina,absolutely awesome. Today I cook lunch,like almost every time I come here.Sanae always tells me my food is overcook,there fore too yang and tight...well,guess what...my food was more yin today,lighter!! So,it's true that your mood or emotional state affects the food U R cooking at that time! Interesting...I actually always burn the food 'cause I leave it on the stove while I go check my emails or wash dishes! !I really didn't believe this,but I have to say....it must be true,'cause since I got back from the retreat (sunday)I feel sooooo relax! !I should do it more often,and actually, I can't wait to go to Northfolk at Eric and Sanae's cabin.I saw the pictures and feel in love with the place...next year,sometime! Hi all, and happy Jewish New Year for any Jews out there reading this! I recently improved how Eric's and Sanae's cookbook show up in Amazon.com search results. This should improve book sales and bring more awareness to the general public. Now, when you search for their book, it will show up if you run a search for "vegan cookbooks" or "vegan" or "vegan macrobiotics" or "macrobiotic cookbooks". While all sellers want their products to show up on the first page of search results, "Love, Eric" and "Love, Eric and Sanae" are showing up on the first few pages, so be sure to purchase them if you're looking for a great cookbook! Took the dogs for a nice walk today to the local park. I miss Dore and Kin, but they're in doggie heaven now. I really had a lot of fun yesterday at Studio Mugen. Everybody's busy with the GRAND OPENING OF SEED!! Junko's not comin'back (I'll miss her a lot) from Japan, at least for a while...so thyere's a new girl, Amy, who happens to live down the street from here, and she's very good with graphics and computers. I also finally meet Christy Morgan, which we met through a macro yahoo-news-group, and found out we were working/volunteering for the same person, Sanae!! I already like them both, and they 'll make this place even more enjoyable. Again, I made lunch today, after bringin'Kula and Oro out. Sanae's very sweet in reassure me that I don't have to feel ashamed when I cook for her and Eric...well...I still feel kinda embarassed! Ayway...here are some pics from today and also the cat has lost the sensitivity in her tongue,so she needs to be fed by Eric and Sanae4. I thought this moment was very sweet, it looks like 2 parents feeding the baby. I was very touched, and I had to take a shot of it. Sanae and Eric both have a dream of opening their own restaurant, and that dream is now becoming a reality! The restaurant will be open daily from 10 am to 9 pm. Seed has been advertised in the "Japan Up!" magazine, which contains Japanese cuisine and trends. See page 35 of the October 2008 edition. The magazine is free. The restaurant is already gaining a lot of publicity, and there is much progress being made on all fronts! Here's what Eric said about the restaurant: "At seed we believe that food is an essential source of our energy, health and happiness. 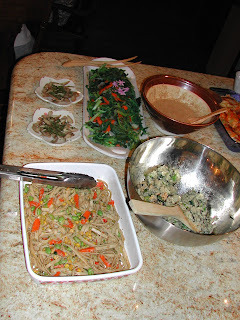 We prepare vegan, macrobiotic cuisine with no animal products, dairy, eggs, or refined sugars. We use locally grown organic produce whenever possible. In the same way that a seed provides the beginnings for a vibrant plant, the food we eat provides the beginnings for a vibrant, flourishing life." Seed is located right near the beach. The location is great, and will without a doubt attract many different people. I can't wait until it opens! In addition to working on the restaurant, Sanae has been writing her new vegan macrobiotic healing cookbook called "Love, Sanae." It's very inspiring to see how far Sanae has come on her journey. She is a role model for the entire community. Her and Eric are finally realizing their goals, and it's very powerful to see this happening. I am honored to be volunteering here at Studio Mugen. It's so nice to see the progress being made. Eric and Sanae are a pleasure to work with. They're both working very hard to change the world of food both for themselves and the world. Till next time...don't forget your miso soup tomorrow morning! Ciao, another wonderful day in Santa Monica...just got here and try to talk to Louise in french, for the very little I know...now Eric and Loise are here, and they are sanding the dining table outside. It's really a wonderful sunny day, and evry day I thank God for taking me over here in Southern California...I'm looking forward today top take Kula and Oro out for our weekly walk. Sooo...I guess I'll be the head chef today!!! I'm actually a little embarassed to cook for such a cook like Eric!! And Louise too, he said she's a great cook...and of course, Sanae, my macro teacher...wow, I have to be good today!! We are 4 of us today, Junko will still be in Japan for the next 2 weeks. 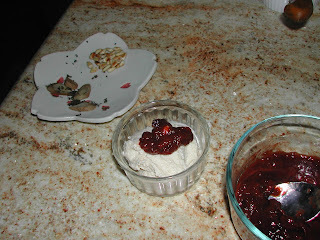 I'll use some leftovers, some buckwheat, I'll try to make it pretty, and some red lentils. I'll also make some greens and maybe I'll cut some pickles too. talk to U all next week! I haven't write in a while, last week nobody was here, so I didn't come. I miss it thou...this is part of my regular routine. Today there are a lot of people, and it makes me feel good, because I'm usually alone, I live alone and I cannot keep any pets...unless I get a note from a doctor stating that "I need it" for emotional support....does somebody have to be messed up to be able to adopt a pet??! Isn't this ridicolous?? Anyway...a Sanae's friend is here, visiting from Japan, ans Eric is here too, and his Mom, Louise, is visiting from Canada. I wish I could speak French, she 's now alone in the garden, and not speaking any English might make Her feel isolated...I only know 1-2 words, so I cannot really communicate with her. I'm sure She's enjoying herself anyway, even just for the great weather!! Beside, I know how hard it is to be away from family, all my relatives and close Friends are back in Italy...anyway, before I start crying (I miss'em so much!! ), I 'm gonna take off, wishing everyone a great week, now I'll go walk with Kula, Oro and Ita who's here visiting us again. Hello everyone, I hope the macrobiotic community is doing great on this beautiful Friday afternoon. I am going to help Sanae make lunch today, after I walk the dogs and work on the website. I'm also contacting Amazon to help increase book sales. There is a lot of interest in the books, "Love, Eric", and "Love, Eric and Sanae". Over time, the Amazon and MySpace support will promote the book sales; it just takes time and patience. As Annalisa said in her previous post, please leave us your comments! We want to hear from you! 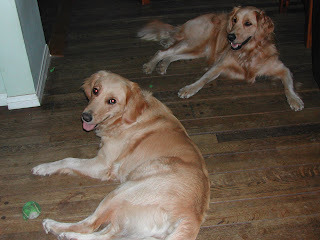 Dore and Kin were two very sweet and loving dogs; we will never forget them. They were both so smart and cute! I can tell that Oro and Kula miss them dearly. They are both in shock and readjusting to not having them around anymore. I just took both of them for a walk two weeks ago and now they're gone forever, but their doggy souls will live on. I took Oro and Kula for a walk today and we went all the way to the beach! It was beautiful and there were many people on the beach for a Friday afternoon. They love going for walks. It's one of my favorite things to do here. I recently set up a MySpace account for studio mugen, so that should promote our blogs and create more traffic to the website, but it takes time for the momentum to build. Until next time...eat well and stay tuned! I wanted to thank everyone who come visit our website,we are having a lot of people checkin'it out,and please, please, please,take just one minute to leave us a comment,even just to say hello! We'd love to hear how we can improve this blog. 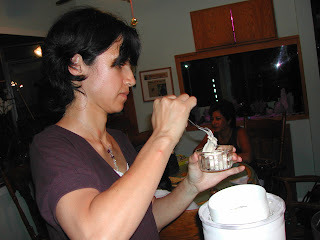 Anyway...a very sad news is that one of the dogs, Dore ("gold"in french) is been hitten by a car about 2 weeks ago, and passed away...I was so sad when I got the news by email from Junko (Junko is the one in the picture making ice cream,vegan,of course)...Her sister Kula is very sad, and it's incredible to notice how animals have a soul and feelings....U know, since a few years ago (at least in Italy) dogs and pets in general wheren't allowed to enter churches...if it was for me it would be the reverse, considering how certain humans (if U can call them so) treat their pets...they are the beast...anyway...don't wanna go on and on on this, don't get me started!!! So...a few yaesr ago in Italy finally the law passed where dogs could enter churches, and also, Victor Hugo said that "try to look a dog in the eyes and say doesn 't have a soul...try to look at Kula's eyes to tell she doesn't realize her sister's gone....it's just unbelievable. Dogs are so capable of loving under no conditions,and this is the way human was inetended to be...I guess before the civilization, who destroyed pretty much all human's essence. Anyway...Dore will be always with us, in all our heart. It makes me even more sad knowing that I just took her for a walk a few days before and she was as happy as ever...Kin is also not doing good...but I don't wanna say more, because she needs positive energy around,and not even a bit of negativity...So...please,say a prayer for them. Also, the picture I posted are from the potluck we had last wesneday. Jessica Porter just moved here in one of Sanae's guesthouse, and she was there too. Everyone's welcome to our potluck...good people, good food, good energy, good everything. WE had a delicious soup by Jessica (millet, squash,onions cabbage), and Sanae made the nuka pickles boiled veggies with a sesame-miso dressing (just the dressing tself...I could have ate it with the spoon! 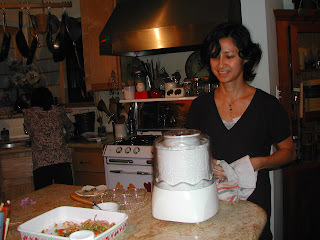 ), I made a quinoa salad, Sonia made superb cabbage rolls, and Junko made a tofu ice cream using an ice cream maker. It was a fun night, hearing all the stories everyone shares. Hello everyone, this is Joel again. Today we had a great lunch consisting of pressed salad and noodles. I topped it off with gomachio and it was delicious. We also had dressing for the salad. I took the dogs for a walk again and worked on the website. I also set up a new MySpace account for Studio Mugen! However, it's currently under construction, but once it goes "live" you will all know about it! When I was volunteering in the kitchen at the Kushi Institute, I learned that it's always better to overcook greens than to undercook them. This makes sense. if you overcook greens (and many other things for that matter), you will drain them of their vitamins and they will be soggy. This is obviously not good and defeats the purpose of getting the most out of your food. However, if they're undercooked, they may be dangerous to eat for some people (depending on the condition of the person), and they won't taste nearly as good. Keep these tips in mind next time you make greens. I always put a pinch of seasalt into the boiling water before adding the greens, and I usually cook them for about five minutes or less, depending on how much your making. Hope this helps; have a great day! Heeey, it's Annalisa again...hope everyone's doing well. Sanae just made an aduki beans tea, it's too hot, but I'd rather burn my tongue 'cause I can't wait to have it! It's very delicious, plus it helps streghtening the kidneys. Today I met a new dog, they are house sitting her since the owner is away. All dogs girls in the house, and as soon as I'm done writing in here I'll take all of them out for a walk and stretch. They have different personalities, and I love to get to know them better during our walks. MMMhh, the tea is great, now ready to drink! Sometimes U can find also aduki beans ice cream, I tried it (I have a very sweet tooth:-)) and it tasted pretty good...believe me, if I say so, it does...being from Italy and having the dairy ones for such a long time (before I got to macrobiotics) !! So,the dogs are really callin'me and lickin' my arms and feet.I must take 'em out before they eat me as their ice creM!! Thanks Annalisa! I'll be sure there's some sushi left for you next time. I'm surprised you didn't get to have any! Sushi sure is fun to make. Today I took all five dogs for a walk and it was great! The weather is so beautiful. The dogs loved their walk and I got some exercise. Eric, Sanae and Junko went to the Kushi Institute for the Summer Conference. I have yet to hear about it but I'm looking forward to learning about their experiences. I know that there were many speakers and classes at the Summer Conference, and many of the staff members have many, many years of experience with Macrobiotics, so I'm sure that it was very enriching and inspiring. I wish I could have been there! Perhaps I can go next summer. Let's hope that they are still holding the Summer Conference for many years to come! Time to help with making the lunch and setting up the new MySpace account for Studio Mugen! GOOD JOB IN MAKING SUSHI JOEL, NEXT TIME PLEASE SAVE ME SOME!!! So, here I am today, I haven't been here at Studio Mugen for 2 weeks, and I missed it, it's like part of my weekly routine. I finished work super early today, so I came earlier, and already took the dogs out, all 4 of them. It's good exercise for me too, it took me about 1 hour and 25 mins alltogether. I was excited just to hear about the summer conference at the Kushi Institute where Eric, sanae and Junko went. Next year I'm planning to go to take level 1, and maybe goin' there for the summer conference too, there are so many wonderful teachers, along with the fact the place itself is beautiful (I saw the pictures). I really can't wait to start studing seriously, I'm trying to read books, nd take classes whenever there are some around, but I love to go when there are those evnts where U dive in the Macrobiotics for days in a row. Here is too easy to get distracted with every day life,a dn I also have to work of course, so I don't have all the time I'd like to dedicate to the study of Macrobiotics. I loved going to the Cruise where I took so many classes, it was great, then French Meadows,and next for me will be Lino Stanchich 's retreat in October. Those events are too far apart, so for me coming here at Studio Mugen gives me the great opportunity to keep touch basewith Macrobiotics every week. I 'm always grateful to God I have this opportunity,a dn also, I live only 23 blocks from here (today I also came with the bicycle, the weather is just too good to use the car). Hello again everyone, this is Joel! I'm preparing my blog today as the cool Pacific Ocean breeze soothes my body. Santa Monica is truly a wonderful town. It's scenic, tranquil, and a great place to have a Macrobiotic community! Today Marco (another Studio Mugen volunteer) fed the dogs and I will take them on their weekly walk again. I made Israeli couscous this week, and boiled some cauliflower. My lunch today will consist of fish, couscous, bread, vegetables, and spaghetti. I rolled my first sushi rolls here at Studio Mugen. It's not the easiest thing to do for a first-timer, but I managed! It's important to wet the nori and roll them tight so that the texture and presentation is good. I had vegetables creeping out of the sides of mine, but that's okay! It was my first time!